Sadly the sun will not rise again for Henry, one of our local Sydney Park swans, who was found dead in the pond reeds Saturday last week. Henry was the father of last years cygnets, the first born in the park. It’s believed he and Matilda had mated again earlier this month, and we were hoping for more cygnets. The park is an off leash dog area but dogs are not allowed in the wet land area which is partially fenced. There is not near enough interaction in the park by the council rangers, and some dog owners could act more responsibly. Last year I witnessed an off leash dog, whose owner had no leash and no control, kill a peahen. 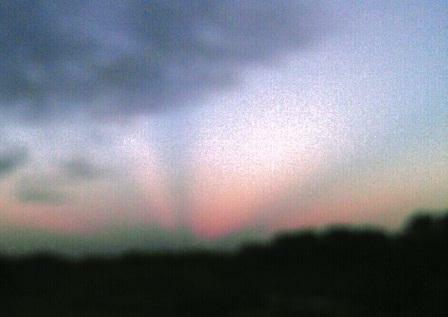 I often have dogs run up and jump on me, including while I was taking the sunrise in the west pic. I’m 5′ 7″, fond and not scared of dogs. Imagine if that wasn’t the case. Henry’s previous mate was mauled and killed by a dog a few years ago. Without knowing if a dog was the cause of Henry’s death, it has added to ongoing controversy. Many park regulars have contacted City of Sydney Councillors voicing their concerns in the hope council will put up better fencing, so it will be safer for the swans and other water birds, and provide greater presence of rangers without restricting the dogs. I received a number of pleasant and/or interested acknowledgments to my own email but only one noteworthy response. Thank you for letting me know about Henry and his death. It is incredibly sad when a well-known member of the community passes, and this also applies to the local birdlife. Swans are so elegant and graceful and just make you feel calmer by watching them. Without any evidence of the cause of Henry’s death, there is nothing that can be done, I am sorry. If you witness any acts of dog attacks on birdlife, or anything for that matter and you have a phone with you, please take photos and send them to Council as it will allow an investigation to proceed. The fencing off of water areas is complex. Some people believe that there should be no restriction of access and there is the counter argument that you raise. The best option, I think, is for comprehensive dog training to be part of dog ownership so we can all share the spaces without negative results. 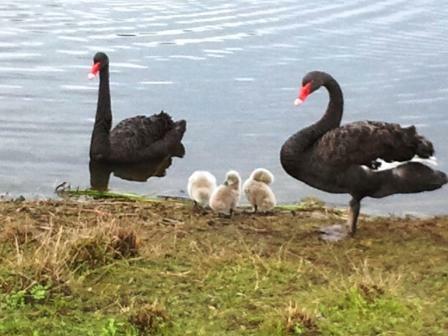 This entry was posted in Blog and tagged Australia, my life, nature, opinion, swans, Sydney Park. 🙂 I’ve had a week of trying not to be p!ssed off and I’m not going to respond to that Councillor’s email as I don’t want to get into a fight about it even though I’d like to because I’m mad as hell. I accidently clicked on the FB photo of the dead Henry which didn’t help. I love dogs and have in the past for decades had pets so I’m not preaching from a theoretical platform. It saddens me almost as much as Henry’s death to see them blamed. I really do feel for you, having been in numerous threatening situations with dogs and one owner who gleefully enjoyed the bullying her very large German Shepherd inflicted! I love dogs too and still mourn the loss of our dear 16 yr old Blue Heeler/cross three years ago. It is quite sickening that people can’t grow up and behave responsibly. Hugs to you. Thanks 🙂 I know you and most people get it. I had a blue heeler, Bo, and it’s almost 10 years she’s been gone. I still miss her, love the dogs in the park as well as the swans, ducks etc, and most of the owners are great. It’s just a few that spoil it. So sorry to hear about Henry. Do swans mate for life? The Councillor has really duck-shoved (or is that swan-shoved?!) the issue. Comprehensive dog training would be a great part of pet ownership, but it is not going to solve this problem. Thank you. Swans supposedly mate for life… but I think it’s an urban myth. Henry’s previous mate Myrtle (before my time) was reportedly attacked by dogs and died at Sydney Park. He hooked up with Matilda last year. There has been news of a second swan in the park this week – I haven’t been since earlier in the week to see – but it could be one of the 3 cygnets from last year who are all grown up now… they all look much the same but Henry had a distinctive marking on his beak. I hope there are no areas where the public has access Ella. Fishing line and litter are amongst the greatest killer of these graceful creatures. If we can’t be trusted to preserve our wildlife I don’t hold out much hope for looking after each other. There’s no fishing at the park, and yes, any number of things might have killed Henry but dog attacks on the water birds there are well documented. I have seen myself Henry chase dogs away from his cygnets. Your last sentence is exactly how I feel – thank you. If one’s child rushed up and terrorised a smaller person in a public place, or killed a wild bird for that matter, what would the response be? I too have warm feeling for dogs but as you point out dogs are not the issue here! It feels extremely irresponsible of your local council to set up a park with swams and dogs off leash but not put effective protective measures in place. Rather strange! RIP Henry. Thank you. I think that one councillor is speaking only for themself. I hope something more will be done. We have been so lucky to have the swans and other water birds make the park their home. Council did put in extra temporary protection measures when Henry & Matilda nested last year and the cygnets were hatched, but it’s fallen off since. Thank you. Swans are magnificent creatures, such an upsetting end for Henry if his death was caused by a dog. We have swans on our local lake, while walking around one time, I saw a dog owner, frantically calling her dog back, as it took off into the water. I overheard her say, he’s never done that before. As well behaved as my dogs are, there are certain situations I would not allow them off the lead……because they are dogs and I don’t feel I can be totally 100% of their actions. Even old Jasp, as infirm as he is, was kept on his lead by some swans on our recent holiday as it is well known adrenalin can kick in. I love a Pink Floyd, the lyrics from their songs are so evocative. Thank you. I’m sad, and posted it for Henry. We hope his death isn’t in vain and that Council will make improvements that cater for everyone. It is so lovely to have the swans there. It could be better for everyone, dogs, kids, people and birds. I agree, you need to have full control over a dog before you let it off, and also assess if the environment is appropriate to do so. I have on more than one occasion had to help someone catch a disobedient dog. While I am a dog lover I hate the off leash areas, so many people treat them as a free for all. Most dogs can’t help themselves when they see a feathery critter within reach, surely the council knew this. I think putting an off lead area near a wetlands is just irresponsible. Perhaps the fencing of the wet area isn’t the answer, maybe the off lead area needs to be fenced instead, don’t restrict the birds access or the people, but keep the dogs from leaving their area. I’d also like to think it wasn’t a dog but… and I’m trying not to be controversial. There’s a lot remediation work currently being done in the park… we’ll see what comes of it. That’s actually a really good idea Metan. I agree… it’s an open area type of park but we’ll see what happens after all the new works are finished. It would be sad to have no swans there as they have made so many people so happy. They’re glorious birds – so stately and elegant. According to FB, there’s another swan, so lets hope so 🙂 It seems even swans have relationship updates on FB these days! Once the weather fines up, I’ll go for a walk and see for myself. It could have been a fox, and if so, well that’s the way of things but the uncontrolled dogs are an issue anyway, sadly. Sad as we are everyone is bearing in mind that there are many possibilties. The council was quite good when the swans nested for the second time, with extra temporary fencing and signs. We hope they will consider the reality that the swans seem keen to make a permanent home in the park. They’ve obviously done something right with the park or the swans would not have come. Now they have to go one step further and make sure the swans can stay… safely. You have a good point and I’m not sure what the Council’s thinking is on the situation – they seem a bit all over the place. They’re probably surprised as all hell to get such new residents and don’thave a clue what to do. That is so terrible, it is so horrible when people think their dogs should be allowed to go where they want. My eldest daughter was terrified of dogs and when they came running up to her she would stand there and scream, and the owners would say, oh its okay their dog wouldn’t hurt anyone, but it just added to her fear, she was 3 years old and had no idea. I think the worse was going to a friends house and their big dog ran up to her, the same dog that knocked her off onto the ground when she was about 18 months old and made her terrified, and them telling me that she needed to get over her fear. Some people. Too true… some people. Terrifying for your daughter, and frustrating for you to be in that position. Last year I got brave (only because the G.O. was with me) and suggested to a couple whose dog was in the water, that the signs saying no dogs in the water near the swans & cygnets were there for a reason. The woman was really rude, and I think would have been more so if the G.O. hadn’t been with me. Her husband was very uncomfortable with it. When I saw the dog kill the peahen there was nothing I could do and there was no way I was going to take photos or say anything to the dog owner who looked mortified… possibly because someone, me, had seen it… even so I saw him a couple of weeks later, leashless and the dog hundreds of yards away. I just wish everyone and everything could respect each other… in your daughter’s case understand that some people aren’t going to love their dog, and in mine enjoy the park equally. People like that really irritate me, I probably would have taken photos so they knew that I was taking them, and that there was a record of what they were doing. I’m not a very brave person either, but sometimes you just have to act. I am glad you said something, even if it fell on deaf ears. The most ridiculous thing is that they are only hurting themselves, if you keep reporting it to the authorities and other people do as well, then soon there will be no no leash areas, because they can’t follow the rules. There aren’t many around us, for the same reason. I don’t believe in off-leash areas for dogs at all and never have. I’m not a dog hater (I have two of my own) and find that it’s usually the owner who is out of control (not the dog). Dogs should always be on a leash in a public area (I can’t state that strongly enough). There needs to be signs at the park telling of very hefty fines for anyone whose dog attacks any bird – I believe people tend to take notice when money is concerned. As far as you taking photos of any dog attacks – how bloody ridiculous! The states spend a lot of money on the upkeep of these places, so why don’t they put their own cameras there? A few signs and warnings of cameras and fines may be a better option. Better fencing for the birds is also a must. When the cygnets hatched the council got their act together for a while – more signs, more fencing, more ranger visits. I believe there were quite a few fines issued and yes, it did make people take notice for a while. The work happening now seems to be about expanding the water catchment which is a primary purpose of the space fair enough, but the talk of permanent fences seems to have been just that, talk. And yes, that email was ridiculous, too ridiculous for me to even reply to it. Thanks – poor Henry, it just seems so unjust. So sorry to hear about Henry. Personally, I think all dogs should be leashed in public parks unless in an enclosed space like a dog park. I am a dog owner and although my dog is friendly and responds to voice commands, I would not want to risk anyone else’s or my dog’s safety. and so your point is very valid, a little dog like Emerson, although with a big heart is disadvantaged. Emerson loved to chase pigeons in NY. That’s why he was always walked on a leash. I let him run a bit (we had a 15 foot retractable leash), but never was he out of my control. So sorry to read this, EllaDee. We have the same off-leash problems here, despite having fenced-in dog parks and stretches of beach set aside for them. Irresponsible dog owners make it bad for us all. Here in the City, Max is on-leach at all times, unless in a secure area. No exceptions. He’s not at all vicious but he’s good-sized and can be frightening, especially to Li’l Ones. I hope the Council can determine a way to better protect the wildlife. Thank you. I understand also as a previous dog owner the bad press irresponsible dog owners can give us. My Bo was a cattle dog, like Celi’s Blue-Boo but with a tail! In Australia they are deemed as a top 5 dangerous dog… a huge generalisation! At least if you have Max on leash, you have the peace of mind to be able to refute any claims. I’d like Sydney Park to be a safe off leash area, and Council could accomplih this, and I think they will, in time. I just hope with no further casualties. Honestly this whole thing that dogs must be allowed to run wild and free is odd. That used to be allowed only in rural areas. But with so many living in apartments and small houses with little or no yards, the dog do need a place to go play for physical and social development. While I understand why owners like dogs off leash – dogs get into trouble – too many owners have little or no control over their dogs. Fenced dog areas are a wonder – Molly goes twice a week to romp in a field with friends. And she is so much better behaved because of it. We get angry at dog owners who do not follow the rules – most of those owners are rude and bullies. Spoil things for everyone. Is there anyway certain areas could be barricaded off when wildlife/birds need to be left along – when there are young ones? They do that here for certain species – and when it’s gator breeding season. They put up signs and sometimes a plastic mesh fencing across areas. Hope some solution can be found. big turtles can be pretty vicious, too! Or Florida has some big snakes they are eager to get rid of. A swan ran after me when I was 13 years old. I was so, so scared! I believe that made me respect their ponds. If you don’t mind me asking, could you visit my blog and read what I posted in English? I started it a few days ago and I could use some helpful hints or opinions on it. I imaging being chased by a swan is something that would stay vivid in your mind. These swans mostly have food on their agenda so are quite friendly, and will eat from your hand. Henry hissed at me once, when I rinsed my empty hand in the water too near him, but otherwise, they quite like people. Sad tale in so many respects. It’s wider issue than the death of a much-loved swan. And interesting you have so many comments from dog people on here. There is a reason why you invariably can’t take dogs into bird reserves (I’m thinking of a few I’ve visited in the UK). Of our four dogs, we’ve only had one remotely interested in chasing birds and they always flew away before he got anywhere near – this was in our garden before you think that they were running around recklessly in the wilds. As everyone knows, Pippa is far more interested in cats. I’m not up on prey drive theory, but I would have thought it would be pretty difficult to get rid of it, so the answer is to be aware of it and behave responsibly. Pippa doesn’t go off lead, although he did have a play with a friend’s dog in an enclosed car park a few years ago, because play and meeting up in the street are good for socialisation as PMotH says about Molly. Sometimes though, it’s easier to find a nice empty beach and let them run on there. Which reminds me, re the comment about fisherpeople/anglers above. One day on the beach our Labrador was happily sniffing around and ended up with a fish hook in his tongue. One of those double-barbed ones, which ever way you try to get it out it digs in further the other way. Sunday afternoon, miles from anywhere, no idea about an emergency vet. .. It does sound as though the council should establish a wetlands area, no fishing, no dogs, etc etc regardless of your unhelpful councillor’s response which was a cop out to say the least. No-one wants to take any freedom from the dogs or expects watertight guarantees, only for Council to undertake their responsibities effectively, rather than efforts which don’t make sense, as the issues have been ongoing with other swans killed (and on record by dogs) in the past. There was a recent media report where Council stated rangers had imposed 18 fines on dog owners in Sydney Park this year… which is a [sad] joke… I see that many transgressions each morning… and no, I haven’t taken photos! I have had a couple of constructive responses which indicate some Councillors have an ongoing interest, and Council is looking into fencing more areas as part of the current work being carried out. Perhaps that is the best we can hope for. One of my gripes too And sadly, I believe it’s true that to some the swans mean nothing, but I saw the hoards of people & kids who came to see (and feed) them. They give so much pleasure, in return for some grass, and naughty bread. I can’t explain how much of a kick, without possibly sounding like a nutcase, I got out of getting to know these swans. They are smart and friendly. All would gently take food from your hand. C3, the smallest cygnet, as a grown swan would recognise me, and the potential for a handful of grass, and climb up the bank to me each morning, much to the amusement of other people. I’ve had Henry in the pond follow my route around along the path until I got to where I could give him his handful of grass, and I’ve seen him do it to others, especially the regulars with bread, as well. On the day before he was killed I gave Henry & Matilda the grass as usual. I was and still am quite devastated that’s he’s gone. Matilda appears to have left also. The first Sydney Park swan was killed in 2009, and she had 2 cygnets which had to be rescued by WIRES… As Council didn’t implement better permanent protective measures then, it’s difficult to believe they will now… the residents will keep pushing for it though. It’s really sad. I don’t think any amount of training will stop most dogs from going for a bird which is within reach – the urge is just too strong. But if it’s a dog that can harm a bird, keep it on leash. I have three but none of them stand a chance (one is tiny, the other two are old and the swans here are quite capable of eating the dog rather than the other way around).